The field has narrowed from 50 to 10 bars. Thank you to everyone who has helped get us this far, we are now in the Top 10 and need your help again to go all the way to the top! Voting is now open as of August 21 and goes through until September 4. Remember you can VOTE DAILY on each device so set reminders and check back every day to give us your vote, we’ll be forever in your debt! REMINDER YOU CAN VOTE BY CLICKING HERE!! 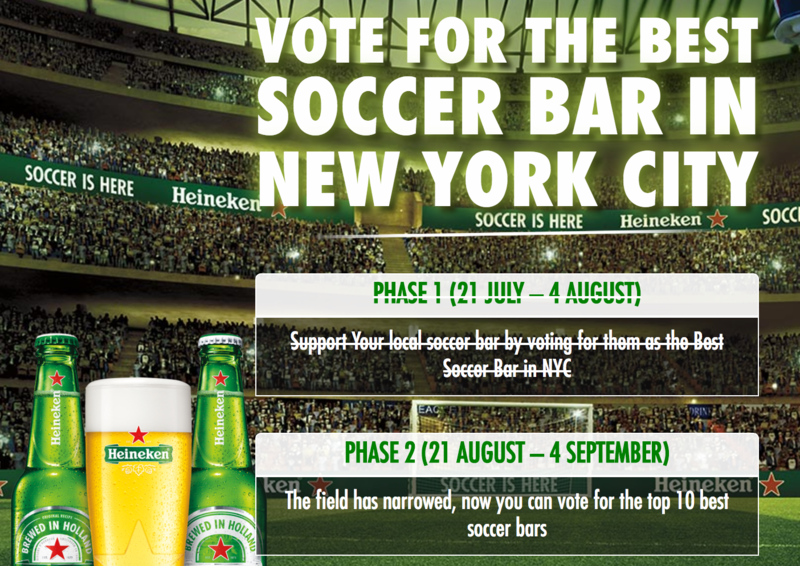 Also, please share this link with everyone you can and support us as we make every effort to reclaim the mantle of ‘Best Soccer Bar in NYC’. Final reminder you can vote by clicking HERE. We appreciate all of your time and support tremendously and we look forward to welcoming you all here throughout the year for games and the build up to next summer’s World Cup! Any questions please feel free to let us know here or you can also just Contact Us. Check out Robbie in the official Top 10 video below and go vote!